Crafted to perfection, this is a small statue of lord ganpati. This small murti can go in your mandir at home, enhance the decor of your home / office or can be an ideal good luck gift. The statue is made from plaster of paris and coated with copper and is heavy in weight. Buy Small Copper Lord Ganesha Statue 3.5", sold & shipped by Yaadein where you can shop online for Pooja Samagri, Hindu Statues, Puja Items, Religious Gifts & Home Decor. 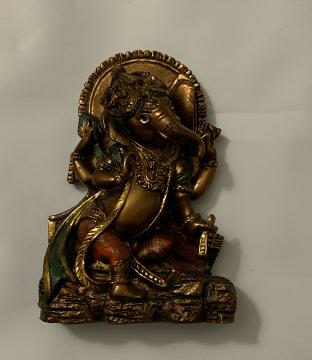 This Small Ganesha Statue collection has been tagged as Hindu, Artisan Handcrafted, Ethnic, Ganesha Murti, Spritual Figurine, Religious Gift Sale.